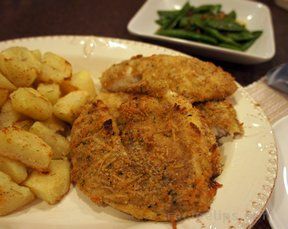 The seafood stuffing is great with the tilapia. 4 tilapia fillets, approximately 1 1/2 to 2 lbs. 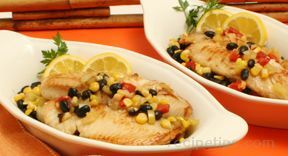 Wash the fish fillets and pat dry. Coat the bottom of a baking pan with the 2 tablespoons of olive oil and set aside. Pour the 1/4 cup olive oil into a medium frying pan and place it over medium high heat until it is hot. Add the celery and onions. Cook until tender. Remove from the heat and add the paprika, salt, rice, sour cream, and crab meat. When this mixture is evenly mixed, lay the fish fillets out flat on a work surface. Add 1/4 of the mixture to the center of each fillet. Roll the fillets up so the stuffing is in the middle and place the fillet in the baking pan. When all the fillets are stuffed, sprinkle them with the 1/2 tsp. of salt, 1/4 tsp. of pepper, and the paprika. 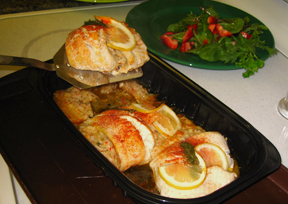 Cover with foil and place them in an oven that is preheated to 350Â°F. and cook for 30 to 45 or until the filets meat is white and flaky.